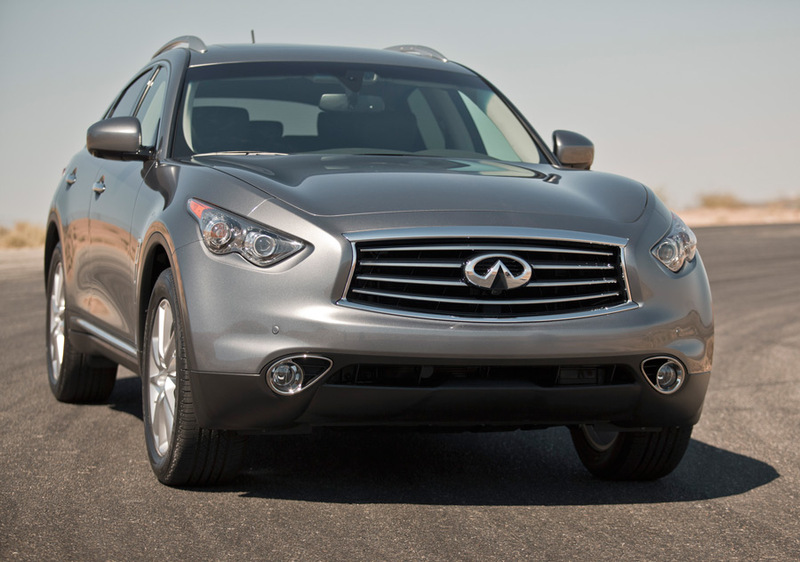 The FX is now in its tenth and final year, as Infiniti’s mid-size crossover for 2014 has been dubbed the QX. During its decade-long production run, the FX has shown us that something that something classified as a crossover doesn’t have to be agonizingly boring, and even in this last batch of 2013 models they’ve added some excitement to an otherwise pretty bleak class of car. The most interesting addition has to be the new 3.7-liter V-6 that makes 325 horsepower, 22 more than the previous V-6. This was the engine fitted to our rear-drive FX37 test car, while all-wheel-drive is available with the 3.7 and the only drivetrain on the pricier FX50 with its big V-8. We owned an Infiniti FX35 in 2003-04. When family considerations made our then daily driver Porsche 911 impractical, we traded in Stuttgart’s finest for the Infiniti. We found the FX to be a great daily driver, with loads of practicality and more than enough spirit to tackle the on-ramps with vigor. It wasn’t a 911, but it was a nice consolation prize when we needed more space. For what it is, and even against some more traditional sporty cars, the FX (with the right wheels and finished in a good color) has always been a pretty sharp, interesting design. It’s unique, and not in a quirky way. 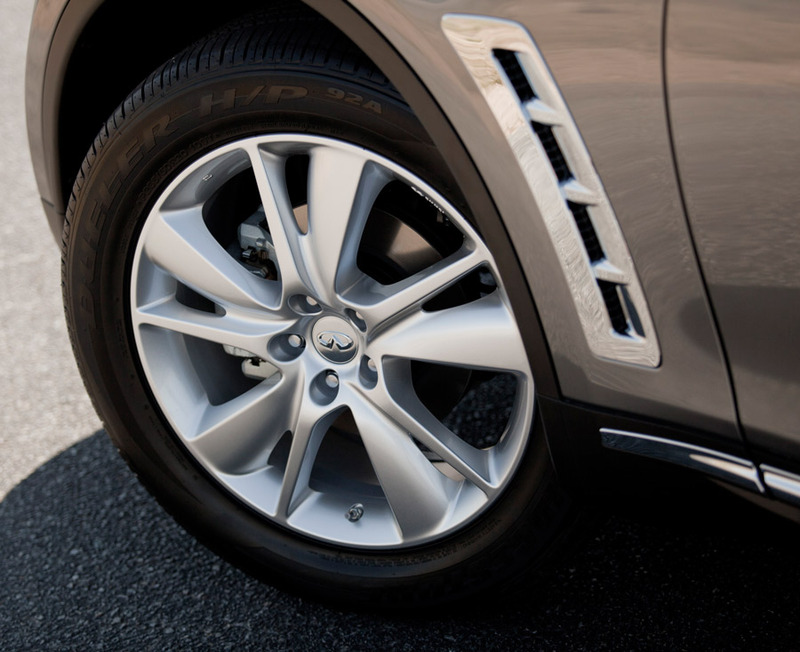 Infiniti just took the concept of a crossover and executed it elegantly. 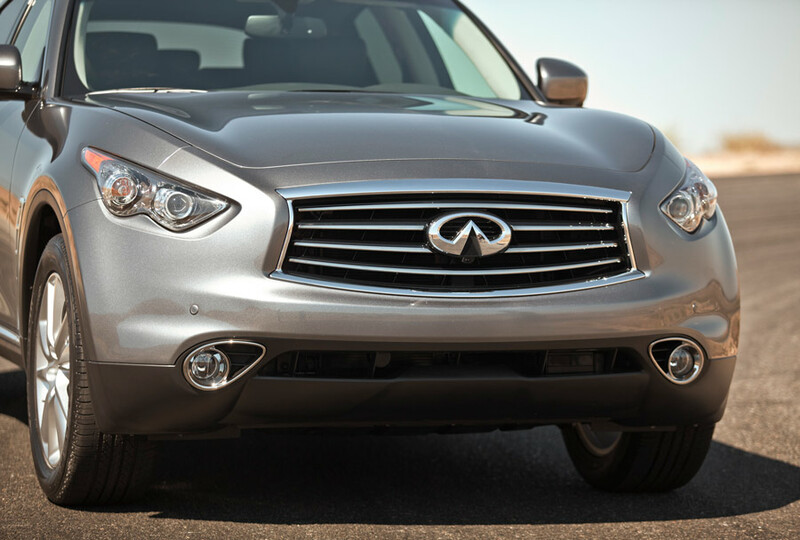 That’s probably why Infiniti has done little to mess with the FX’s good looks over the last ten years. Its long hood, stretched wheelbase, and short overhangs at front and rear certainly get our approval, while some of the slightly less tasteful-looking bits like the protruding LED taillights and side air vents are actually functional. The taillights make downforce, while the vents take in air and reduce front end lift. The five-spoke 20-inch wheels that came with the Deluxe Touring Package on our test car were also a welcome addition, and while there are more exciting things you could get with almost fifty-six grand, this is still a car that you’d be proud to have in the driveway. 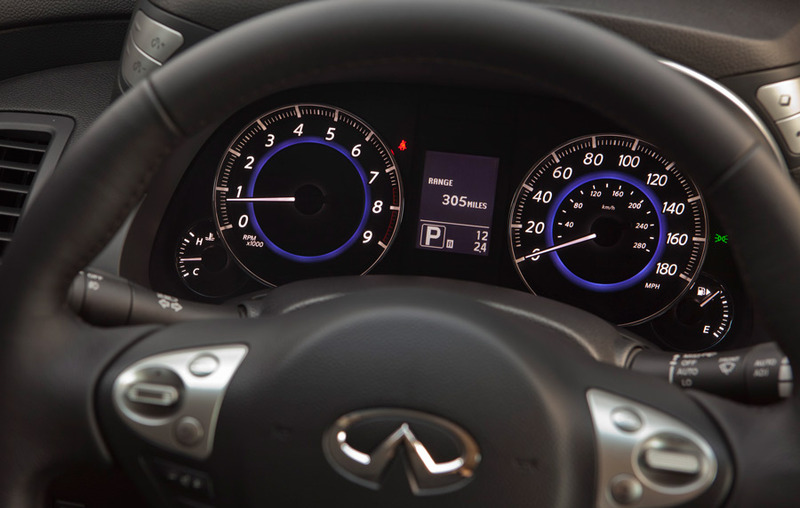 It’s no secret that we like what Infiniti is doing with their interiors these days, and it’s more good news with this FX. Like the M56 we tested recently, it has a premium look and feel that would make getting stuck in a traffic jam not so bad after all. The Deluxe Touring Package gets you maple accents, quilted leather-appointed seating, climate controlled front seats, and aluminum accenting on the pedals. For connectivity’s sake we had an 8-inch touch screen and no less than four 12-volt power outlets, while sound comes through an 11-speaker Bose system that was specifically designed for the FX. Room inside is predictably ample, and five adults would have no problem riding in comfort. For a family with a couple of kids or more and luggage, however, the room in the back might not cut it. The new 3.7-liter VVEL motor with aluminum block and heads is really torquey, and with a what now seems to be ubiquitous 7-speed automatic (the only one available on the FX), you are never at any point left without power to play with. With 22 more horsepower and 5 more lb/ft of torque than the last FX, it also makes a mean sound that you likely won’t hear coming out of anything else burdened with the word “crossover”. Driving the FX37 leaves you sitting up pretty high, but the suspension (double wishbones up front and multi-link in rear) is set up stiffly it doesn’t take long to work up the confidence to toss it into a corner like you would a much lower machine. It is, quite honestly, an odd but exciting feeling, and the FX37 definitely felt flatter than the NISMO Juke we tested. A sports car it is not, but it can still be a surprisingly rewarding driver if pushed. Similar to our experience owning a FX35, driving the latest version of Infiniti’s cool crossover was a much-welcomed blast from the past. Unlike ten years ago, the market is now bloated with vehicles designated as crossovers, and people keep buying them while manufacturers keep coming up with more. Even Porsche is set to make one with the Macan. Yet, the Infinitis have always been a bit of a breath of fresh air in that world, and for now it can still be called king of the crossover hill. Practical and fun, the FX37 would be more than welcomed back into our family.